""God is faithful, by whom ye were called unto the fellowship of his Son Jesus Christ our Lord" (1 Corinthians 1:9). This Polished Sterling Silver Jerusalem Cross Pendant showcases a symbol of faith that's been used for nearly a thousand years. The Jerusalem Cross is actually five symmetrical crosses in one: a large cross that divides this emblem into quarters and four smaller crosses, one in each quadrant. Also known as the Crusader's cross, this symbol first appeared as part of the coat of arms of the Jerusalem Kingdom and has several interpretations. For instance, some say that the four smaller crosses represent Matthew, Mark, Luke and John, while the larger cross represents Christ; others say that this symbol represents the spread of the gospel to the four corners of the earth; still others say that the five cross represent the five wounds that Christ sustained when He suffered. 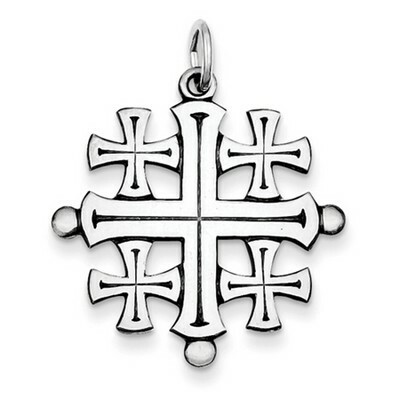 Regardless of which meaning resonates most with you, this .925 silver cross pendant's highly polished finish makes it a piece with lasting appeal. Cross measures 27mm (1 1/16") x 27mm (1 1/16") not including bail. We guarantee our Polished Sterling Silver Jerusalem Cross Pendant to be high quality, authentic jewelry, as described above.